After all, it can be summarised in one sentence: deposit a copy of the peer-reviewed manuscript with a repository or ask the publisher to make the version of record available freely (if the latter involves a fee contact your library). Sadly, the practice of open access is often more complicated, due to the way it is implemented. The recently launched Open Access Policy Schema (Excel xlsx), which helps policymakers to express their policies in a consistent way, is a step towards simplification. Some of the complexity stems from outdated, difficult to use systems that don’t interoperate. These problems can be fixed, for example by implementing digital identifiers such as ORCID, to facilitate automated exchange of information and tracking of publications. However, the real issue is, as usual, not technology but politics – or to be specific: the countless number of policies that govern open access. The Registry of Open Access Repository Mandates and Policies (ROARMAP) lists 767 – just from research organisations and funders. The problem becomes even bigger if you add publishers into the mix: embargo periods and open access policies usually vary not just between publishers but journals, of which there are many thousands. Current solutions tend to be workarounds. Jisc’s SHERPA services can help to navigate funder and journal policies, but the complexity remains and institutional policies are not included. University libraries in the UK are increasingly offering a ‘deposit and forget’ service to academics, but this only moves the problem from the researcher into the library (although a good workflow operated at scale is much more efficient). Current research information systems and repository providers are working towards representing open access policies in their systems, for example with new workflows around the deposit of articles to meet the requirements for the UK’s Research Excellence Framework (REF) (see Imperial College’s implementation of Symplectic’s workflow as an example). Despite a concerted effort across the sector, the underlying problems remain. It is simply not possible to develop an easy, re-usable workflow when faced with a myriad of different implementation requirements caused by different policies – policies that are usually not available in machine reading form and sometimes so complicated even specialists are confused. The ideal solution would be one unified open access policy. If funders and institutions had the same open access requirements, it would be easy to provide guidance for academics. Such a policy would also be a powerful incentive to publishers to meet the requirements for all outputs, especially if shared internationally. Similarly, the task of system providers would be made much easier. For the foreseeable future this may remain a utopia. However, this should not stop us from moving in this direction. In my view, two steps are required. The first would be to express policies in a systematic way, preferably machine-readable. Not only would this make it easier to analyse and compare policies, it also serves as an encouragement to consider whether policies could be simplified. This could then lead to the second step: an effort to simplify and harmonise policies, to make the scholarly communications system easier and more efficient. 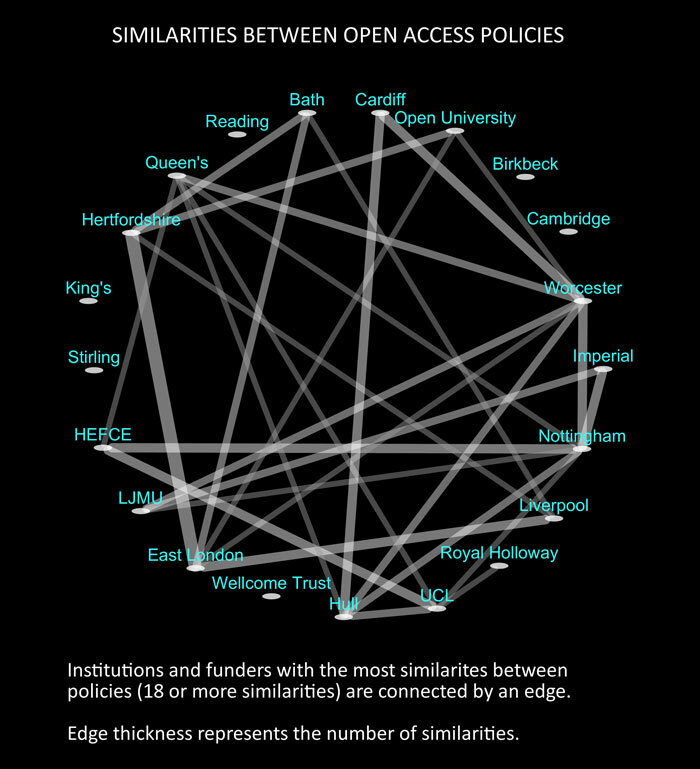 Circular network showing similarities between UK universities and funders OA policies (18 or more common fields). Jisc, the SHERPA services and ROARMAP have taken a step in this direction, by jointly developing a schema for open access policies. The schema is intended to help policymakers “to express their policies in a systematic manner”, as “an initial step to ensure greater clarity and uniformity in the way information about open access policies is recorded and made available”. Imperial College was one of 30 institutions that provided information to develop the new initiative. Based on data from the UK participants, Jisc have produced infographics including flowcharts and a network of policy similarities. How can you support a simplified approach? Collecting more data on institutions and funders open access policies would enable a more systematic analysis of policy similarities and differences – a starting point for an effort to simplify policies. It would also be interesting to explore whether the data could be integrated into systems to help with compliance checking and advice. Therefore I would encourage others to provide data to the initiative. Participation is relatively simple: it involves filling in a spreadsheet with 40 fields (Excel xlsx), many of which are optional – this takes less than an hour. Perhaps, if institutions can demonstrate that we have made an effort towards policy harmonisation we might also find it easier to include funders in this discussion. Personally I would prefer to move towards a simple, easy-to-communicate policy – deposit the manuscript, pay only for full open access journals – but this requires a broader, informed discussion, based on good data. The Open Access Policy Schema is a step in that direction. Torsten is responsible for the development and implementation of Imperial College’s scholarly communications strategy and in particular the cross-College activities in open access and research data management. Before joining Imperial he was a programme manager at Jisc and worked at King’s College London, the University of Munich and the Bavarian State Library. Of direct relevance is the European project PASTEUR4OA (Open Access Policy Alignment Strategies for European Union Research - http://www.pasteur4oa.eu/). An early deliverable was the relaunch of ROARMAP, with nearly 700 policies classified under a new and comprehensive classification scheme. Building on an analysis of successful policies in ROARMAP, the project has produced guidelines on what makes a policy effective (see Alma Swan’s Open Access policy effectiveness: A briefing paper for research institutions - http://www.pasteur4oa.eu/sites/pasteur4oa/files/resource/Policy%20effectiveness%20-%20institutions%20final.pdf). An extensive suite of resources, including this briefing paper, is at: http://www.pasteur4oa.eu/resources. Thank you for sharing more information about the PASTEUR4OA project aims and resources (http://www.pasteur4oa.eu/resources).